What do you need to crack this exam? To attain success in any competitive exam, it is imperative to have a command over each and every subject with tactics to solve the questions in the specified time limit. Additionally, a platform that offers an assurance of strategic preparation plan obligatory to step up the ladder of accomplishment. 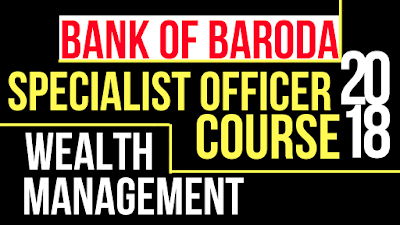 Exactly, Team BankExamsToday after relishing a glorious success in Bank of India credit officer Exam 2018 with 21 final selections and 50+ selected candidates for Phase II RBI Grade, is at your disposal to offer you a strategically designed bundle of four courses that promises 100% syllabus coverage of Bank of Baroda SO 2018: Wealth Management Exam.